We shipped the November 2009 release of the Silverlight Toolkit a little over a week ago and it includes a handful of improvements to the Data Visualization assembly. It also adds support for the new Silverlight 4 Beta! And while we were busy getting the October/November Toolkits out the door, the WPF team previewed WPF 4 along with the .NET 4 and Visual Studio 2010 Beta! Which means there are now four platforms of interest to developers: Silverlight 3, Silverlight 4, WPF 3.5, and WPF 4. And the Silverlight/WPF Data Visualization assembly supports them all! As with previous Data Visualization Development Releases, I've updated to the most recent Toolkit code. And like last time, the Silverlight Toolkit shipped most recently so the code in the new Development Release is identical to what just went out with the Silverlight 3/4 Toolkits. However, people using Data Visualization on WPF 3.5 or 4 can take advantage of the latest changes by updating to the binaries included with this Development Release or by compiling the corresponding code themselves. Previously, there was a single Visual Studio 2008 SilverlightWpfDataVisualization.sln file for both Silverlight 3 and WPF 3.5. Because Silverlight 4 and WPF 4 use Visual Studio 2010, there's a new SilverlightWpfDataVisualization4.sln file for those two platforms. The two solutions (and the projects within) look and act exactly the same - they're separate because they compile with different tools and because separation lets people who haven't upgraded continue to use the VS 2008 solution. I always strive for code that builds with no compile or code analysis warnings, and that's still the case when compiling for Silverlight 3, WPF 3.5, and Silverlight 4 (though the last is a bit of a cheat because code analysis doesn't work there yet). But the new .NET 4 tools include some improvements, and there were three new kinds of warnings when I first compiled for WPF 4. Two of them were easily addressed with trivial changes I already made, but the third requires a bit more (potentially destabilizing) work that was not done for this release: Warning 2 CA1062 : Microsoft.Design : In externally visible method 'Foo', validate parameter 'Bar' before using it. As it happens, there was already a work item for this task because we knew we weren't checking everywhere we should. So if you see this warning when compiling the WPF 4 assembly, please don't be alarmed! WPF 4 includes the Visual State Manager classes in the framework, so the WPF 4 Data Visualization assembly no longer has a dependency on the WPF Toolkit! The DataVisualizationDemos application is a collection of all the Data Visualization samples I've posted to my blog. Like the Data Visualization assembly itself, the demo application runs on Silverlight 3 and 4 as well as WPF 3.5 and 4 and shares the same code and XAML across all four platforms. Not only is it a convenient way to look at a variety of sample code, it also has links back to the relevant blog posts for more detail about each sample. 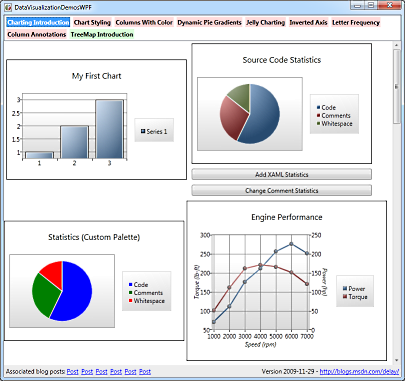 Click here to download the complete source code for the cross-platform DataVisualizationDemos sample application. I've followed the same dual-solution and #if approaches that I describe above. I casually mentioned two tricks for sharing the same XAML across Silverlight and WPF in the notes of a post a couple weeks ago. I used both techniques in my DataVisualizationDemos project (which compiles for Silverlight and WPF from the same source code) and wanted to call them out for others in similar situations. The feedback I got was quite positive - until Brian Elgaard Bennett tried the subclassing trick with HierarchicalDataTemplate. While there's no reason that shouldn't work, it doesn't. What's going on is that WPF doesn't support subclassing DataTemplate or any of its children. What's worse, nobody expects this when they bump into it! [I know a few of us have independently reported the same issue to the WPF team - it's kind of like a rite of passage. :) ] So the right people are aware of the problem, and maybe - just maybe - the new XAML parser in .NET 4 will help fix things. But that doesn't matter for WPF 3.5 development today - and because my XAML sharing trick relies on subclassing, the situation seems pretty dire. I think it was something like the ninety-ninth idea that finally worked. First, here's the XAML we'll be sharing. There's nothing fancy, just some standard controls that are part of the core framework for WPF, and part of the SDK/Toolkit for Silverlight. Aside: In the ideal world, we wouldn't need to use an XML namespace prefix under Silverlight and therefore this problem would never come up in the first place. Unfortunately, Silverlight 3 and the Silverlight 4 Beta don't support XmlnsDefinitionAttribute, so the fact that the SDK/Toolkit assemblies already properly implement it doesn't help us. The interesting thing to note above is that all the relevant controls (DockPanel, Viewbox, TreeView, TreeViewItem, and HierarchicalDataTemplate) have a prefix and that things look just like you'd expect them to under WPF if you went to the trouble of specifying the namespace explicitly. And, in fact, that's all there is for WPF - just be explicit with the XAML and you're done! Aside from some extern alias/using stuff at the top to disambiguate references, there's nothing here we didn't see last time around - in fact, the subclassing trick for HierarchicalDataTemplate looks just like it does for the other classes. But I thought that trick didn't work for HierarchicalDataTemplate? Right, it doesn't work on WPF - but this assembly is Silverlight-only. Then you need a matching assembly for WPF or else the project won't compile because of the XMLNS reference. Unless the corresponding assembly already exists on WPF. The Silverlight-only assembly is named PresentationFramework.dll, the same name as the platform assembly that contains the actual implementations of the controls for WPF. The Silverlight platform doesn't have a PresentationFramework.dll, and this latest trick takes advantage of that fact to sneak one in. Because Silverlight doesn't suffer from the same DataTemplate subclassing bug, it's perfectly okay to subclass HierarchicalDataTemplate there. So the original subclassing trick does 95% of what we want, the control wrapping trick adds Viewbox, and the PresentationFramework trick adds HierarchicalDataTemplate - which means we're 100% covered! Well, at least until someone contacts me to report another problem. Which would no doubt be interesting to debug and I'd certainly want to have a look. We've just published the November 09 release of the Silverlight Toolkit in conjunction with today's unveiling of the Silverlight 4 Beta! The Silverlight 4 Beta offers a bunch of neat new features which enable even more compelling online (and offline!) applications. Stuff like bi-directional text, web cam and microphone support, a RichTextArea control, clipboard access, ICommand, an elevated-trust model, printing, notifications, right-click, and more! SL3/SL4: We've added a new control, BusyIndicator, based on the ActivityControl found in the RIA Services project template and samples. BusyIndicator makes it easy to add a "Please wait..." progress indicator to applications and does so in a way that's easy to customize. It's a simple control, but a handy one. I have a few examples below; please see David Poll's blog for more. SL3/SL4: Minor tweaks to Data Visualization: Support more flexible subclassing scenarios of core classes, provide more helpful exception messages in some scenarios, tweak default Chart template to respect Padding, change type of Chart.LegendItems collection items to object for flexibility, convert Legend to a HeaderedItemsControl for consistency. SL3/SL4: It's now possible to collect code coverage statistics when running unit tests with the Silverlight Unit Test Framework! Jeff spent some time this release productizing some clever hackery Ted Glaza originally did about a year ago, and this new capability fills a pretty big hole in the unit testing story for Silverlight. We're also including a couple of the custom build actions that we use internally - now you'll be able to use them in your projects! And we're including the XML files to make it easy for customers to enable Application Library Caching for their projects. For more information on these topics, please have a look at Jeff Wilcox's blog. SL4: We've modified all the Toolkit/SDK control visuals and input handlers to behave correctly for right-to-left cultures and added mouse wheel support in some of the obvious places. SL4: We've removed ImplicitStyleManager because Silverlight 4 supports implicit styles natively. Correspondingly, we've modified the Theme-based wrapper classes (TwilightBlue, ShinyRed, etc.) to use implicit styles. SL4: Viewbox has moved into the Silverlight 4 core (i.e., it's available in the System.Windows.dll assembly that every Silverlight 4 install includes), so it has been removed from the Silverlight 4 Toolkit. SL4: Along with the new MEF (Managed Extensibility Framework) features in the Silverlight 4 SDK, there's an experimental System.ComponentModel.Composition.Packaging.Toolkit assembly in the Toolkit that adds support for downloading secondary XAP’s and loading them into a MEF catalog. For more information, please have a look at Wes Haggard's blog. Another property to be aware of is the DisplayAfter property which lets you configure the initial delay before the busy indicator is shown - to avoid the annoying "on/off" flicker that would otherwise result from a lot of quick operations in succession. The BusyIndicator page of the public sample project has an interactive section where you can experiment with various delays and durations to see how this looks in action. To convert this XAML over to Silverlight 4's implicit style support, just remove the highlighted portion above. The visuals will look exactly the same, but everything is more efficient because the platform is handling it internally. And what's more, various scenarios that were tricky to get working with ImplicitStyleManager (like styling the contents of a TabControl) now "just work" thanks to the new framework support for implicit styles! Silverlight 4 has a lot of great improvements that really raise the bar for rich, interactive web applications. I encourage everyone to check it out today and start thinking about how to take advantage of all the new stuff! :) And when you're done with that, please check out the live Toolkit samples for Silverlight 3 or Silverlight 4, download the Toolkit installer(s) for the platform/platforms of your choice, and enjoy! 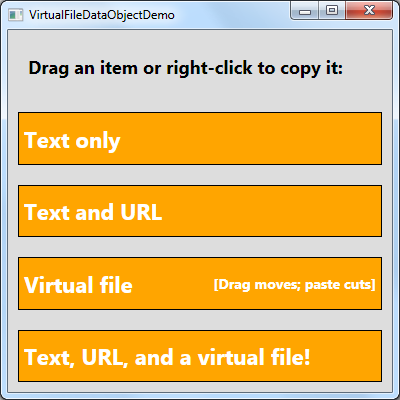 A couple of weeks ago I wrote about VirtualFileDataObject, my developer-friendly virtual file implementation for .NET and WPF. I followed that up by adding support for asynchronous behavior to improve the user experience during long-running operations. Last week, these posts got a shout-out from blogging legend Raymond Chen, whose work provided the inspiration for the project. [Best week ever! :) ] Now it's time for one last tweak to wrap things up! Please note that the begin/end actions are now of type Action<VirtualFileDataObject>. The new parameter is always a reference to the active VirtualFileDataObject instance and is provided to make it easy to use anonymous methods like you see above. Aside: Otherwise you'd need to capture the VirtualFileDataObject instance so you could pass it to the action being provided to that same instance's constructor! (Catch-22 much?) While there may be a clever way to do this without making the begin/end actions properties of the class (which I didn't want to do because that wouldn't ensure they're invariant), passing the VirtualFileDataObject in this manner is both easy and obvious. Further aside: As a consequence of the changes to support these new properties, VirtualFileDataObject now implements the IDataObject::SetData method for HGLOBAL-style data. So if there's some other CFSTR_ property that's relevant to your scenario, you can query it off the VirtualFileDataObject instance in much the same manner! And that's pretty much all there is to it! With the addition of PreferredDropEffect and PerformedDropEffect (and PasteSucceeded, though it's not demonstrated above), VirtualFileDataObject makes it easy for your application to provide a seamless virtual file drag/drop experience with all the sophisticated nuances users expect from a polished Windows application. 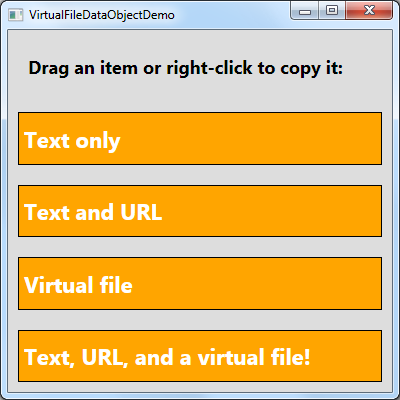 Last week I posted the code for VirtualFileDataObject, an easy-to-use implementation of virtual files for .NET and WPF. This code implements the standard IDataObject COM interface for drag-and-drop and clipboard operations and is specifically targeted at scenarios where an application wants to allow the user to drag an element to a folder and create a file (or files) dynamically on the drop/paste. The standard .NET APIs for drag-and-drop don't support this scenario, so VirtualFileDataObject ended up being a custom implementation of the System.Runtime.InteropServices.ComTypes.IDataObject interface. Fortunately, the specifics aren't too difficult, and a series of posts by Raymond Chen paved the way (in native code). If you read my previous post, you may recall there was an issue with the last scenario of the sample: the application became unresponsive while data for the virtual file was downloading from the web. While this unresponsiveness won't be a noticeable for scenarios involving local data, scenarios that create large files or hit the network are at risk. Well, it's time to find a solution! Okay, so that didn't work out quite how we wanted it to. Maybe we defined the interface incorrectly? Maybe we implemented it incorrectly? Or maybe Windows just doesn't support this scenario?? No, no, and no. We've done everything right - it's the platform that has betrayed us. :( Specifically, the DragDrop.DoDragDrop method does something sneaky under the covers: it wraps our respectable System.Runtime.InteropServices.ComTypes.IDataObject instance in a System.Windows.DataObject wrapper. Because this wrapper object doesn't implement or forward IAsyncOperation, it's as if the interface doesn't exist! Aside: I have the fortune of working with some of the people who wrote this code in the first place, and I asked why this extra level of indirection was necessary. The answer is that it probably isn't - or at least nobody remembers why it's there or why it couldn't be removed now. So the good news is they'll be looking at changing this behavior in a future release of WPF. The bad news is that the change probably won't happen in time for the upcoming WPF 4 release. Because we've been careful to define the VirtualFileDataObject.DoDragDrop replacement method with the same signature as the DoDragDrop method it's replacing, updating the sample to use it is trivial. 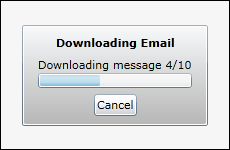 So run the sample again, and - BAM - no more unresponsive window during the transfer! (For real, this time.) You can switch to the window, resize it, drag it, etc. all during the creation of the virtual file. /// Initializes a new instance of the VirtualFileDataObject class. So I've added support to VirtualFileDataObject for calling the begin/end actions in synchronous mode based on some semi-educated guesses. In my testing, the notifications during synchronous mode behave as identically as possible to those in asynchronous mode. Granted, in some scenarios startAction may run a little earlier in synchronous mode than it would have for asynchronous mode - but as far as the typical developer is concerned, VirtualFileDataObject offers the same handy behavior for both modes! 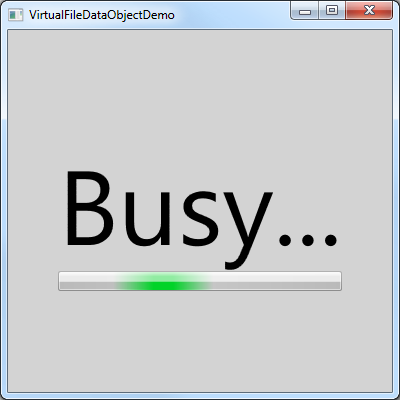 The BusyScreen variable above corresponds to a new element in the sample application that provides the simple "Busy..." UI shown above. In real life, we'd probably use MVVM and a bool IsBusy property on our data model to trigger this, but for a sample application, toggling Visibility works fine. Because all the hard work is done by the VirtualFileDataObject class [you're welcome! :) ], the application remains unencumbered by complex logic for anything related to the management of virtual files. 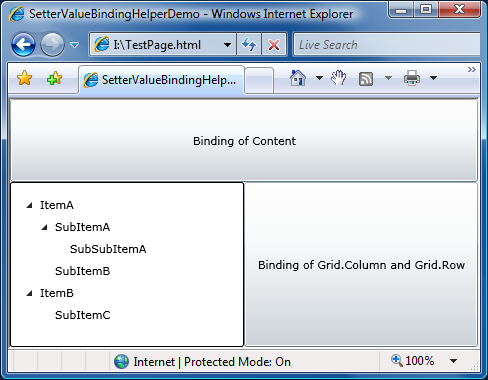 Back in May, I mentioned that Silverlight 2 and 3 don't support putting a Binding in the Value of a Setter. I explained why this is useful (ex: MVVM, TreeView expansion, developer/designer separation, etc.) and shared a helper class I wrote to implement the intended functionality on Silverlight. My workaround supported setters for normal DependencyPropertys as well as attached ones, so it covered all the bases. It worked well on both flavors of Silverlight and a bunch of you went off and used SetterValueBindingHelper successfully in your own projects. Important aside: The Silverlight team takes backward compatibility very seriously, so running any Silverlight 2 or 3 application with SetterValueBindingHelper on such a future version of Silverlight would continue to work in the expected manner. The Silverlight team makes a concerted effort to ensure that each version of Silverlight is "bug compatible" with previous versions to prevent existing applications from suddenly breaking when a new version of Silverlight comes out. However, were someone to recompile such an application to target a newer release of Silverlight, that application would no longer be subject to the backwards compatibility quirks and would begin seeing the new (more correct/consistent) platform behavior. Type="System.Windows.Controls.Grid, System.Windows, Version=2.0.5.0, Culture=neutral, PublicKeyToken=7cec85d7bea7798e"
Tangential aside: This kind of platform change wouldn't affect just SetterValueBindingHelper - any place where multiple Setters targeted the same Property would behave differently. But that difference won't matter 99% of the time - SetterValueBindingHelper is fairly unique in its need that every Value be applied. One idea for a fix is to expose something like PropertyBinding2 from SetterValueBindingHelper and treat it just like another PropertyBinding. While that would definitely work, how do we know that two properties is enough? What if you need three or four? No, despite its simplicity, this is not the flexible solution we're looking for. Taking a step back, what we really want is to somehow provide an arbitrary number of Property/Binding pairs instead of being limited to just one. And if you read that last sentence and thought "Collection! ", I like the way you think. :) Specifically, what if the same SetterValueBindingHelper class we're already using to provide the attached DependencyProperty and the data for it were also capable of storing a collection of other SetterValueBindingHelper objects? Yeah, sure, that would work! Every current use of SetterValueBindingHelper should continue to be valid after we make our changes. In other words, upgrading should be a simple matter of dropping in the new SetterValueBindingHelper.cs file and that's all. The new SetterValueBindingHelper syntax should work correctly for the current Silverlight 3 release as well as this mythical future version of Silverlight with the WPF-consistent Style changes. The new collection syntax should be easy to use and easy to understand. Arbitrary nesting is unnecessary; either someone's using a SetterValueBindingHelper on its own, or else they're using it as a container for a single, nested layer of SetterValueBindingHelper children. We could try to be fancy and let children inherit things from their parent, but it's not actually as useful as it seems. Let's not go there and instead keep everything simple and consistent. Aside: The two different ways of identifying Grid above are part of the original sample showing that both ways work - in practice, both instances would use the simple "Grid" form. Other than the namespace change to "delay" (for consistency with my other samples), the only change here is the extra SetterValueBindingHelper wrapper you see highlighted. Everything else is pretty much the same and now it works on imaginary versions of Silverlight, too! :) So if you're working on an app and you find yourself needing SetterValueBindingHelper, please use this latest version; you can rest assured that you're future-proof. /// to set the Binding. /// Binding to set on the specified property. /// Used when multiple Bindings need to be applied to the same element. /// Gets the value of the PropertyBinding attached DependencyProperty. /// Sets the value of the PropertyBinding attached DependencyProperty. /// Change handler for the PropertyBinding attached DependencyProperty. /// Applies the Binding represented by the SetterValueBindingHelper. /// Returns a stream of assemblies to search for the provided type name.